A high luminance of 1,500 cd/m2 enables the PN-V602A to perform superbly in brightly lit indoor locations, even those awash in sunlight. And thanks to the monitor’s high contrast, onscreen images are clearly visible from a distance. This means the PN-V602A can be installed in places where it is well out of reach, but not out of sight. 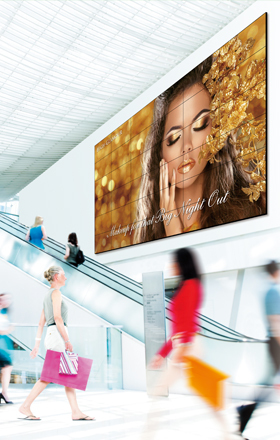 Indoor sports facilities, transport hubs, shopping centres, and event venues are just some of the many settings where the PN-V602A can give vivid display to high-quality images. The PN-V602A incorporates Sharp's original UV2A* technology, which prevents light leakage and ensures highly efficient use of light from the backlight. Thanks to this technology, the monitor achieves truly bright whites, amazingly vivid colours, and extremely deep blacks. Furthermore, a full-array LED backlight ensures uniform brightness across the entire monitor. * UV2A stands for Ultraviolet-induced Multi-domain Vertical Alignment, a photo-alignmenttechnology that ensures uniform alignment of liquid crystal molecules. Multiple PN-V602A monitors can be joined together to create video walls configured to a variety of purposes and settings. 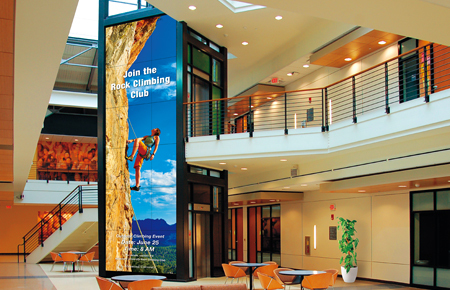 Easy to assemble and easily controlled via the RS-232C interface or via a network*, video walls composed of Sharp PN-V602A monitors bring dynamic, high-impact exposure to commercial display content. * The PN-ZB02 Interface Expansion Board is required for control via a network. The PN-V602A owes much of its outstanding black levels, amazing contrast, and superb energy efficiency to local dimming of the LED backlight. 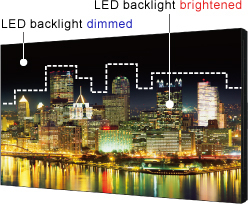 Local dimming allows specific groups of LEDs to be independently dimmed or brightened for greater control of the darkness and brightness in different areas of the monitor, resulting in considerably reduced power consumption. That’s why the PN-V602A can deliver significantly better contrast and brightness than conventional LCD monitors while using remarkably less power. * Results of Sharp measurements when displaying broadcast content (sub-clause 11.6) stipulated under IEC 62087 Ed. 2.0 and with brightness set to maximum. 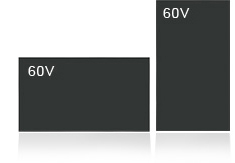 Note that the power consumption reduction will vary depending on the images displayed. Sharp Digital Signage Software is versatile management software that provides total support for the creation, scheduling, distribution, and display of a wide range of content for Sharp LCD monitors. Whether distributing scheduled programs over a large network or via a USB flash drive, users can select the software version that matches their needs, their business environment, and their existing systems. The Brightness Sensor* function ensures clear visibility by automatically adjusting backlight brightness to complement surrounding brightness levels. In dark surroundings, backlight brightness automatically lowers, providing optimal viewing and energy savings as well. With Mirror Display mode*, the same image can be displayed on a daisy chain of PN-V602A monitor for the powerful impact of visual repetition. * Up to five monitors (using DVI daisy-chain connection). * Requires optional Interface Expansion Board. The PN-V602A conforms to the RoHS Directive restricting the use of hazardous substances. The PN-V602A offers a choice of landscape or portrait installation, allowing customers to select the mode that best suits their display content and application. VESA-compliant mounts provide right/left pivot and swivel, ensuring a high level of safety when the PN-V602A is mounted on a wall or suspended from a ceiling. To ensure safe handling, the PN-V602A comes with heavy-duty carrying handles*. * Pre-assembled with main unit. The PN-V602A is rugged enough for continuous 24/7 operation in the most demanding professional applications. The Power on Delay function allows a time delay between the startup of each monitor in video walls or multi-monitor installations. This reduces the load placed on the power supply when a number of monitors are turned on at the same time. Should the temperature inside a monitor rise, a built-in sensor will detect it, and the backlight system will automatically adjust to keep the temperature within operational level*. * The monitor automatically goes to standby mode when the internal temperature remains consistently above operational level. Thanks to its RS-232C interface, the PN-V602A can be easily controlled and monitored from a central location via a PC. Each monitor can be assigned an individual ID code to specify when remotely turning that monitor on or off, changing its input, or making various screen adjustments and settings. For total ease of operation, the Schedule function allows up to eight settings to be pre-programmed for automatic monitor turn on/off at precise times on a daily, weekly, or one-time basis. To boost the troubleshooting efficiency of service technicians, operating logs, signal changes, information on operating irregularities, and other such data can be saved and tracked. The Hardware Diagnostics function detects any irregularities in power supply voltage and indicates it on the monitor. With the E-Mail Notification* function, display status updates will be sent periodically to a specified e-mail address. A notice will also be sent if a malfunction occurs. The PN-V602A can be easily operated through a Web browser and monitor control software*. Display status, continuous operating time, and other parameters can be monitored over a local area network using Simple Network Management Protocol (SNMP)*. With an analogue PC connection, when a change occurs to the input signal timing, the clock phase will automatically adjust accordingly.